At NQ4I we strive to adhere to not only the rules of ham radio contesting but also to the spirit of contesting. 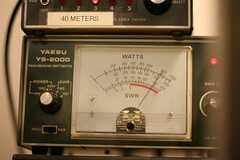 Each station (Run and Mult) has a Yaesu YS-2000 peak reading wattmeter or similar which is routinely checked against a Bird Wattmeter. Each station runs a maximum of 1500 watts. Feel free to contact any of our ops listed on this web site about our ethical standards. We even have a federal judge on our team along with a first place WRTC participant! Most noticed is that there is a high degree of standardization at NQ4I. Radios have been chosen to provide the ultimate amount of RX and TX discrimination when used in-band. There is a system of high power "casket" filters on 80m, 40m,and 20m. These filters provide approximately 80 db of out of band rejection at the amplifier output. in addition W3NQN filters are used at the output of each TenTec Orion 565 for additional rejection. The liberal use of ferrite cores is exsistent at every station. The TenTec Orions are rated by #5 on the Sherwood Engineering site for RX standards. The ARRL labratory has also rate the TX output of the Orion as one of the highest in spectral purity. These combinations give the NQ4I Team the very utmost in rejection of INBAND and OUT of BAND rejection. The ability for the RUN Station and the MULT Station to hear when either is transmitting is very desired in a M-M environment. The Orion 565 meets these standards very well. TenTec Orion 565 transceiver with Alpha 78 amp. The antennas are 5/5/5 stack at heights of 105/75/45 ft. The top two antennas rotate and the bottom antenna is fixed on SA. A MicroHam MicroKeyer is used to interface with the logging computer. TenTec Orion 565 Transceiver and Alpha 87A amp. Antennas are 7/7/7/7 stack of home brew design stacked at 125/105/85/65. This stack will provide 22 dbi of gain into EU and 19 dbi towards JA. Interlocked with a device designed by W4DD for positive interlock with the 10 Meter MULT station. MicroHam MicroKeyer for interfacing with the computer. TenTec Orion 565 Transceiver and a Henry 3K-A amp. The antennas are a 6 element at 105 ft and a Telrex 8 element at 165 ft. The 8 element antenna is approx 1300 ft from the 8/8/8 stack and provides the ultimate in distance separation. The MULT station has a MicroHam MicroKeyer to interface with the logging computer. TenTec Orion 565 Transceiver and Henry 3K-A amp. The Henry 3K-A has been modified by KD3P of Henry Radio fame and now has a single 8877 in place of the previous 3-500Z tubes. Antennas for the RUN station are 8/8/8 at heights of 155/105/55 ft. The top 2 antennas rotate fully and the bottom antenna is fixed on EU. Gain to EU is approx 21.5 dbi. The RUN station is fully locked out with the MULT station with a box designed by W4DD. The RUN station is interfaced with the logging computer with a MicroHam MicroKeyer. TenTec Orion 565 Transceiver and Henry 3K Classic II amp. The antennas include a 4 element yagi at 85 ft and a 5 element yagi at 175 ft. The 5 element yagi is located over 800 ft away from the other 20m antennas for maximum separation. A MicroHam MicroKeyer is used to interface with the logging computer. TenTec Orion 565 Transceiver and Alpha 77DX amp. The antennas consist of a 8 element homebrew design on a 89 ft boom, stacked with a pair of 5 element designs. The heights are 175/125/85 ft. All three antennas are full rotable and as a stack provide 21.2 dbi of gain when used together. The RUN station is fully locked out with the MULT station. A MicroHam MicroKeyer is used to interface with the logging computer. A W2IHY EQ Plus is installed to provide the ultimate in audio shaping and tailoring for the RUN station. TenTec Orion 565 Transceiver and Henry 3KD Premier amp. The antenna is a 4 element KLM installed at 160 ft, and the tower is separated from the RUN station antennas by more than 800 ft. A MircoHam Microkeyer is installed to interface with the logging computer. TenTec Orion 565 Transceiver and Henry 3K Classic amp. Antennas are a pair of 3 element yagis by Telrex at 155 and 90 ft heights. Approximately 14.5 dbi gain from both antennas to EU. The RUn station is locked out by a box designed by W4DD. A MicroHam MicroKeyer is provided to interface with the logging computer. A W2IHY EQ Plus is installed to provide the utmost in audio shaping and tailoring for the RUN station. A W2IHY EQ Plus is installed to provide the ultimate in audio tailoring and shaping for the RUN Station audio on SSB. TenTec Orion 565 Transceiver and a Heath SB220 amp. The antenna is a 4 square array providing 4-5 db of gain. The beverage system of 6 beverages is available to the MULT station at any time. Lock out is provided with the RUN station, designed by W4DD. A MicroHam MicroKeyer is installed to interface with the logging computer. TenTec Orion 565 Transceiver and Henry 3K-A amp. The antennas for the 80m RUN station include a 12 element LPDA array at 145 ft height. This is the largest 80m antenna in North America. It has a 220 ft boom, is installed between 2 towers on a catenary line and fixed on EU. It provides 13.5 dbi gain and is resonant from 3.4 mhz to 4.2 mhz. A second antenna is available to the RUN station, it is a 3/8 wave top loaded vertical, providing nearly as much gain as a 4 square system. A MicroHam MicroKeyer is installed to interface with the logging computer. A W2IHY EQ Plus is installed to provide the utmiost in audio tailoring and shaping for the RUN station. A system of 6 beverages 880 ft in length are available to the 80m Run station at any time. TenTec Orion 565 Transceiver and Alpha 77DX amp. The antennas are three 3/8 wave top loaded verticals designed by W4SVO. They provide 3-4 db gain on the 160m band and are directional. A system of 6 beverages is available at any time to the 160m Station.A MicroHam MicroKeyer is installed to interface with the logging computer.